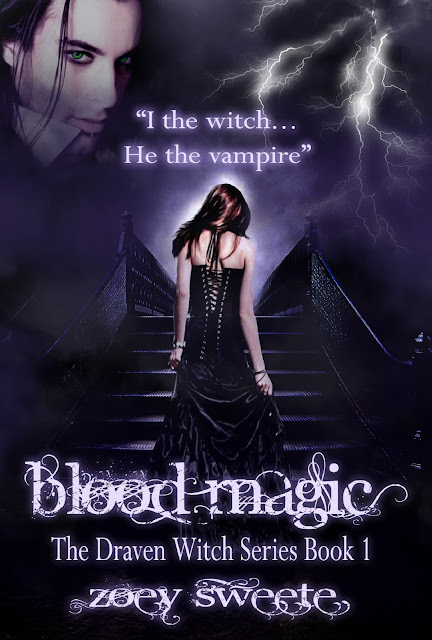 I had the privilege of reading and reviewing Blood Magic by Zoey Sweete. In book one of the Draven Witch series, 20 year old Renee Draven wants nothing more than to live her life like an average mortal: to go to college, maybe have a few friends, and get married. But she is not your average girl. She is a witch, from a very long family line of witches – and for centuries her ancestors had all be hunted, haunted, tortured and killed by Damaskeos, the big bad vampire/immortal sorcerer demon guy. All that remained of the Draven Witches were Renee and her mother, who had been protected by (and fell in love with) Renee’s dad, Thomas Kane. Renee grew up in the shadow of being foretold to being the one to save them all through a prophecy told by her great, great grandmother, Annabelle. I thoroughly enjoyed this book. It had a great storyline, and the flow of the book made for very easy reading. The character of Renee was very relatable, and I found myself invested in her very early on. The author does a great job of explaining the history of the family in a way that doesn’t confuse the reader. Renee’s love life is complex, to say the least. Complicating that even more is the fact that she will never be given the freedom to choose who she ends up with – her “true love” is said to be pre-destined. I felt a bit sorry for Devin, but when Tristan entered the picture, all of that flew out the window. His character was compelling, and when he and Renee took their relationship to the next level, I was cheering them both on. I enjoyed the twist of William and Dante sharing the same blood – it made everything that much more complicated. To be honest, I’m still not 100% convinced that William is Renee’s “true one.” I shall see as I continue with the series. To be adored by so many handsome men…Renee is one lucky girl. Well, aside from the fact that so many other evil and scary people want to see her dead – there is that. I believe the final battle was done very well on the author’s part. She portrayed Renee in a very strong and commanding way – showing the growth of the character from the beginning of the book. Of course, all battles have casualties, and this was no different. Classic to well-done series, just when you think the battle is over and the villain is defeated, he rises from the abyss to fight another day. I just started book two, and can’t wait to see where she takes the story from here.